The global economy is way past the point of maximum debt saturation, and so the next stop is debt exhaustion. Just as generals fight the last war, central banks always fight the last financial crisis. The Global Financial Crisis (GFC) of 2008-09 was primarily one of liquidity as markets froze up as a result of the collapse of the highly leveraged subprime mortgage sector that had commoditized fraud (hat tip to Manoj S.) via liar loans and designed-to-implode mortgage backed securities. The central bank "solution" to institutionalized, commoditized fraud was to lower interest rates to zero and enable tens of trillions in new debt. 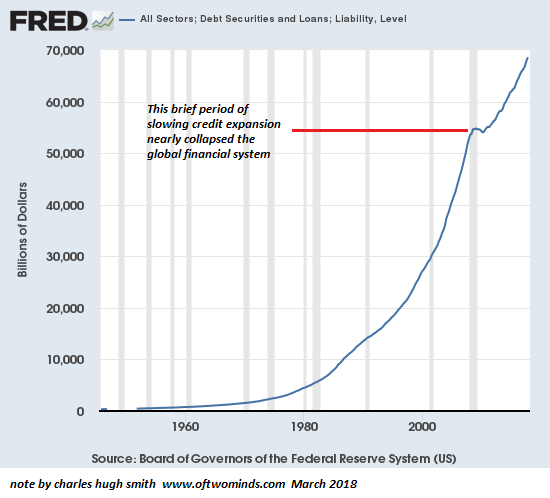 As a result, total debt in the U.S. has soared to trillion, roughly 3.5 times GDP, and global debt has skyrocketed from trillion to 0 trillion.